Want to Save Thousands of Dollars on Skin Care? Read this! Patients need to understand that everybody’s DNA is unique, and so their skin care should be. Nobody will age the same way, at the same rate, with the same symptoms. Aging skin looks different on different people. It could be fine lines and wrinkles, lack of firmness, lack of elasticity, lack of radiance, brown spots and sun damage, redness, sensitivity, large pores, dark circles…. 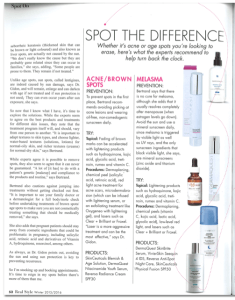 one person might be presenting one of visible signs of aging (ex: only wrinkles), another person might show 3 signs (ex: wrinkles, large pores and lack of firmness), another person a different combination of 3 (ex: brown spots, large pores, lack of radiance) and another all of them at once. The problem comes when you are being sold (or choose) an anti-aging product for a certain sign of aging (let’s call it “A”), when it actually doesn’t address directly that issue (because the ingredients it contains actually work on “B” and “C”). Do you know what your ideal skin care routine should be? Which specific ingredients, texture and combination of actives will work for YOUR skin and yield the best results? 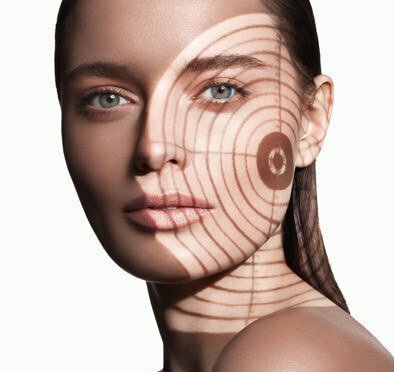 Book today for our 1-hour skin consultation, let’s build a routine that is 100% customized to you + let’s track improvement over time with our computer-based skin analysis. Real Style Network: What are some of the ways skin gets marked over the years (ie acne, sun damage, pregnancy, age spots)? Marie Bertrand: “One of the first “marks” we can observe in children is freckles. Freckles are actually sun-induced (interesting fact: you’ll never see a new born baby with freckles), but different people have a different “threshold” (or cumulative amount of sun exposure) before they develop freckles. It is generally accepted in the industry that blonds and redheads will usually develop freckles much faster than darker phototypes. When puberty arises, we often see acne appearing in teenagers. This inflammatory skin condition often leaves “marks” on the skin, whether they are temporary (redness & brown spots after the acne lesion is gone, a condition that should resolve naturally within a few weeks to a few months) or permanent (or true acne scars, that leave a permanent indentation in the skin long after the lesion has disappeared). Pregnancy brings a whole new level of skin changes, including a very common skin condition called melasma, or pregnancy mask. It is caused by the combination of estrogens, sun and light exposure, and is a very common skin disorder. Melasma presents itself as a symmetrical hyperpigmentation of the face and neck, and can also be triggered by birth control pill and other hormonal changes (you don’t need to be pregnant to develop melasma) combined with sun & light exposure. 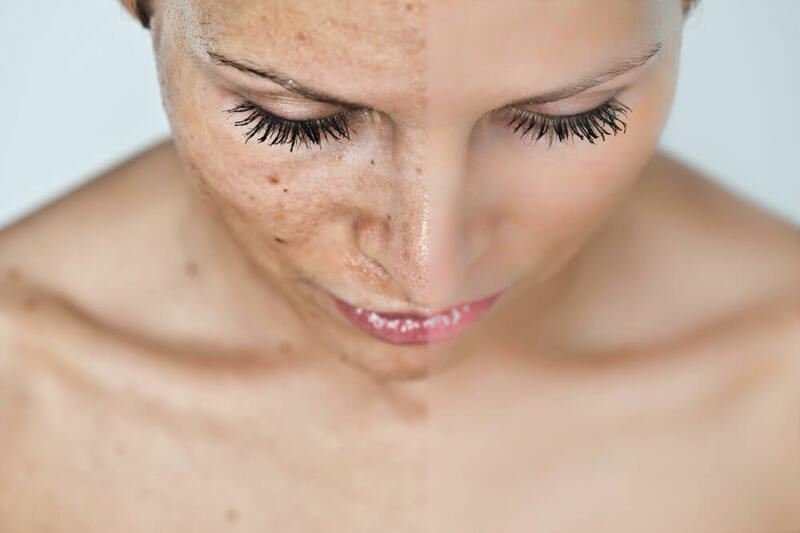 This is why melasma tends to become darker during the sunnier summer months. 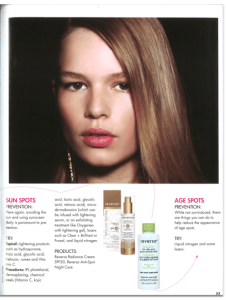 With time and cumulative sun exposure, age spots can develop in sun-exposed areas, including the face, hands and decolleté. It is important to see your family doctor or a dermatologist for a full body/mole check before under taking treatments of brown spots/ age spots to make sure you are not cosmetically treating something that should be medically removed”. For more information, and to read the entire interview, grab a copy of Real Style Network’s Winter 2015-2016 edition. A largescale study that included women from Germany and China has demonstrated a link between levels of traffic-related air pollution and air pollution-associated gases with the formation of dark spots on the skin, known as lentigenes. The most pronounced changes were observed on the cheeks of Asian women over the age of 50. The report is published in the Journal of Investigative Dermatology. “In addition to particulate matter, traffic-related air pollution is characterized by increased concentration of nitrogen dioxide (NO2). While NO2 exposure is known to be associated with low lung function and lung cancer, the effect of NO2 on human skin has never been investigated. This is important because environmentally-induced lung and skin aging appear to be closely related,” explained lead investigator Jean Krutmann, MD, of the IUF-Leibniz Research Institute for Environmental Medicine, Dusseldorf, Germany. Two groups were studied. The first included 806 Caucasian German women who were part of the SALIA study (Study on the influence of Air pollution on Lung function, Inflammation and Aging). The average age was 73.5 years (range 67 to 80 years) and 20% had a history of smoking. These women reportedly spent an average of 2.6 hours a day in the sun. The second group included 743 Han Chinese women from the Taizhou region who were somewhat younger than the SALIA group, with an average age of 59 (range 28 to 70 years). Twenty percent of this group had a history of smoking, with a reported average daily sun exposure of 3.5 hours. Many more women in the SALIA group reported using cosmetics with sun protection (61% vs. 4.2%). The mean levels of NO2 exposure were 28.8 µg/m3 in the SALIA study and 24.1 µg/m3 in the Taizhou China group. No association was seen between levels of NO2 and lentigenes’ formation on the back of the hands or forearms, however, exposure to NO2 was significantly associated with more lentigenes on the cheeks in both German and Chinese women older than 50 years. Overall, an increase of 10 µg/m3 in NO2 concentration was associated with approximately 25% more dark spots. The spots were visually evaluated by trained personnel according to photo reference scales and quantified using a validated skin aging score system (SCINEXA). The investigators performed sensitivity analysis to see whether they could pinpoint whether it was the concentration of particulate matter or NO2 gas that had a greater impact on dark spot formation. They found that the NO2 gas had a slightly stronger effect than the particulate matter concentration. Lentigenes, also known as liver spots, are small, darkened areas of the skin. Although they may first appear small, they may enlarge and separate patches may merge. They are most commonly found on the face, forearms, hands, and upper trunk. Usually brown in color, lentigenes can appear yellow-tan to black. Lentigenes are more common in light-skinned individuals and in the US, solar (sun-associated) lentigenes are noted in 90% of Caucasians older than 60 and 20% of those younger than 35 years. Lentigenes, which contain an increased number of the melanin-forming cells of the skin (melanocytes), are generally benign, although some forms may be pre-cancerous.